"Well, things aren't as good as they could be. But they're looking up. We're...we're fighting hard." — Mike, speaking to the people of Mombasa about the fake "resistance"
Mike Branley was an officer in the New Mombasa Police Department in 2552. 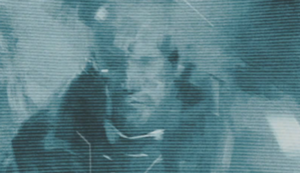 During the Covenant attack on Earth, on October 20, 2552, Branley was driving Commissioner Kinsler around. He intervened when Kinsler attempted to take advantage of Sadie Endesha, who had been looking for her father; he refused, however, to bring her to the city center, where the Covenant invasion was at its most brutal. Later, Branley changed his mind, running over a small pack of Brutes with his car and returning to assist Endesha. While traveling to the city, the pair encountered Kinsler again; this time, the corrupt commissioner had a police-issue Pelican in his possession. Kinsler trapped the two on a bridge and forced Branley to throw his sidearm off the edge. The duo were saved when Vergil crashed an Olifant into the Pelican; after thoroughly damaging the dropship, the AI emptied the truck's contents onto the Commissioner. Branley and Endesha opted to then use the garbage truck to continue toward the city, though Branley was somewhat hesitant to use the vehicle. Inside the Olifant, the two of them encountered a salesman named Tom Uberti, who promptly gave away their position to the Covenant; he had heard that one of the alien races was friendly, and believed he could surrender. Branley and Endesha escaped out of the truck's rear as it was destroyed. After Sadie contacted her father again, the Superintendent was shut down. After Mike stated that no one was crazy enough to deactivate the AI during an invasion, Sadie implied that Kinsler would be. Mike told Sadie that Vergil could be re-activated at the NMPD Headquarters. Upon entering the structure's lobby, the two were immediately taken hostage. A SWAT team quickly resolved the situation, and the two continued to the Communications Headquarters, where they convinced the on-duty officer at "gunpoint" to turn Vergil back on. Throughout their travels, Mike had been hearing numerous propaganda messages, and he was getting tired of them. Realizing that they were being broadcast from inside the building, he asked the announcer to stop telling lies. The announcer argued that the only people listening were frightened citizens hiding from the Covenant, and the lies gave them hope. When they went back on the air, Mike, under the name of Harris 'Two Shot' Kibaki, tried to tell the truth, only to find himself telling the same kinds of lies the announcer had told. Kinsler overheard the broadcast, and contacted the propaganda station, telling Sadie that her father was being held hostage in the data center. He instructed her to meet him at a train station -- alone. Kinsler captured Sadie in a train that was going to leave the city. Mike rallied the civilians to fight Kinsler's corrupt men instead of panicking; the newly-formed mob promptly killed the commissioner. Sadie attempted to return to Vergil's data center, but Mike and the AI convinced her to escape the city. During the audio files, it's suggested that Mike has feelings for Sadie, which possibly gave him reason to save her. At one point he whispers to himself "Gee Branley, the things you'll do for a kiss..." When asked by Sadie what he said, he shouts back over the crowd, "I said I won't let you down miss!" It is unknown if Mike and Sadie started a relationship after fleeing New Mombasa. He is voiced by Dave Wittenberg. Branley is presumably of Afrikaner descent as he has a strong Afrikaans accent.